US President Donald Trump declined to hear the translation of his South Korean counterpart Moon Jae-in’s response to a reporter at the White House on Wednesday, which may have contained crucial information. Moon and Trump held a summit to discuss collaboration for the upcoming Pyongyang-Washington talks. 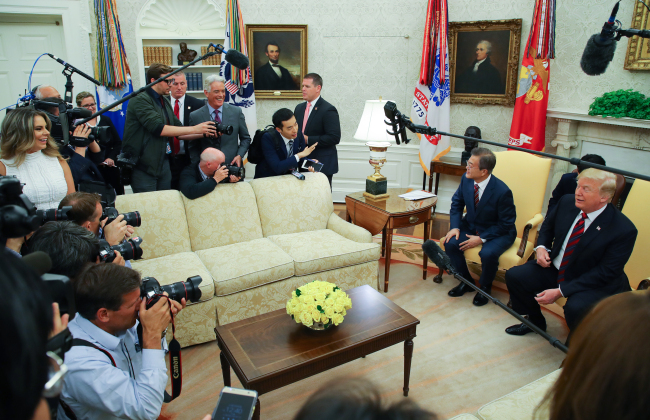 In the last part of the dialogue with the reporters, Moon reiterated that his role in the summit between North Korean leader Kim Jong-un and Trump was not that of a mediator but one that helps to bring forth a successful outcome. Just as the two presidents were wrapping up the question-and-answer session, a Korean reporter made a stab at a final question, to which Moon gave a response in Korean. Trump brushed aside the Korean-to-English translator, perhaps due to time constraint. The following is an unofficial translation of what the Korean reporter asked and how Moon answered. Reporter: How big of a role do you think the South Korean government has to play in the North Korea-US summit plans? There are concerns that the North is showing a change in its attitude. What is your opinion on this? Moon: Recent changes in the North’s attitudes have cast concern among many people whether the North-US summit will take place as planned. I firmly believe that it will happen according to the prearranged schedule. As for my role, rather than mediate between the North and the US, I am here for the success of the North-US summit, as it casts great influence on the Korean Peninsula and the fate of the Republic of Korea. I would like to say that we are in a mutually dependent and collaborative relationship with the US. Trump: And I don’t have to hear the translation because I’m sure I’ve heard it before. Good bye everybody. Thank you.